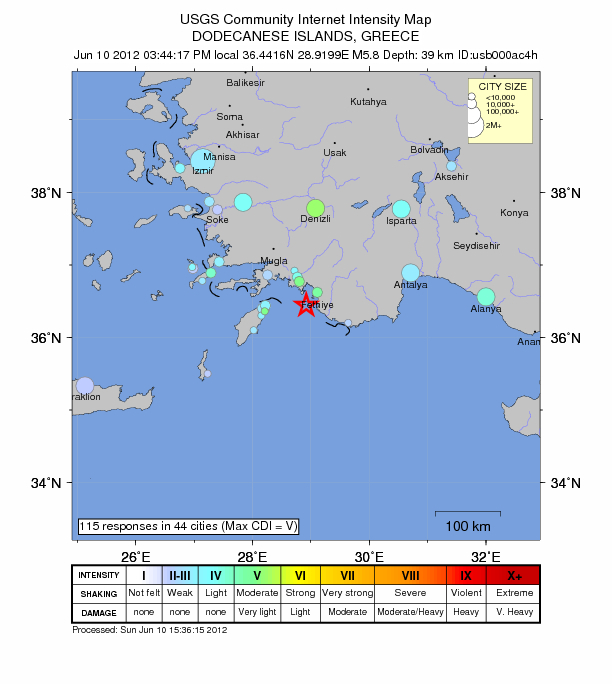 Strong and dangerous earthquake with recorded magnitude of 5.8 struck Dodecanese Islands, Greece on Sunday, June 10, 2012 at 12:44 UTC according to USGS. 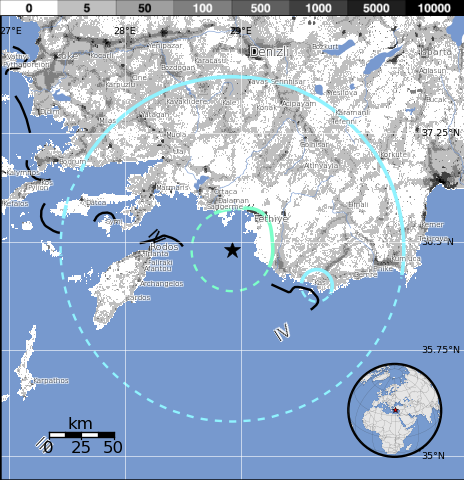 Epicenter was along the Turkey and Greece coast, located 63 km (39 miles) E of Rodos, Dodecanese Islands, Greece (36.442°N, 28.920°E). 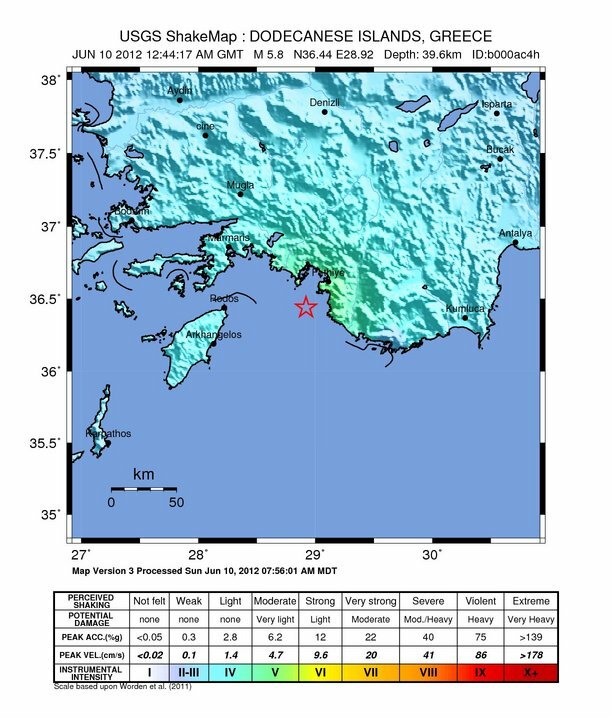 Recorded depth was 39.6 km (24.6 miles). EMSC recorded magnitude 6.0 earthquake with depth of 30km. At least 15 aftershocks have been noticed so far. Turkish press talks about 7 injured people who are treated in hospitals. All of them have been jumping from their balconies! The Turkish specialized earthquake forces are currently making assessments of eventual damage, but we have no reports from them so far. 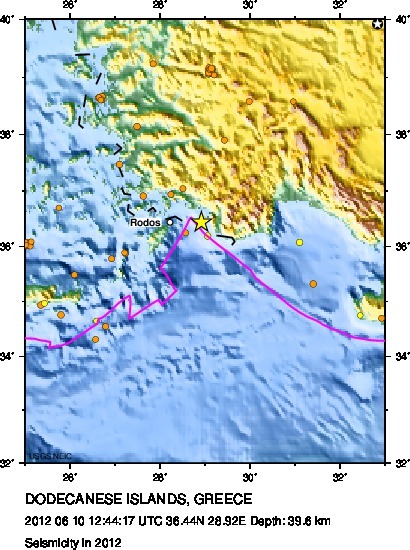 The epicenter of the earthquake is also only 31 km SW Fethiye, Turkey (pop 60,437). Luckily it is below the sea floor, but the impact will still be considerable in the Turkish cities of Fethiye and Dalaman. Both cities are also Tourist destinations. Electricity and mobile communications have been lost in Fethiye. Selected Cities Exposedfrom GeoNames Database of Cities with 1,000 or more residents.